Art Loop Open has transformed ten venues in downtown Chicago into interactive public art exhibits. With over $60,000 in prizes at stake, your votes determine which artists win. Today, Friday the 15th of October is the opening of a new kind of art show in downtown Chicago. The Art Loop Open (organized by the Chicago Loop Alliance and the Chicago Artists Coalition) is a 200 artist show, spread throughout the city - at 10 different locations. These artists were selected by a jury of distinguished art pros but the winners of the show are chosen by you - the audience. And what do the winners get? Aside from the great exposure and the opportunity to meet other talented folks - there's over $60,000 in prize money. 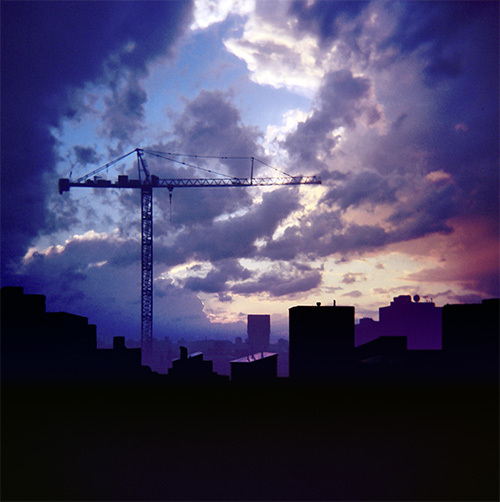 My Re-Constructs print 124 W. Polk | Dusk is showing at the Merchandise Mart. The Mart is huge, and there's a lot of great work covering the walls. 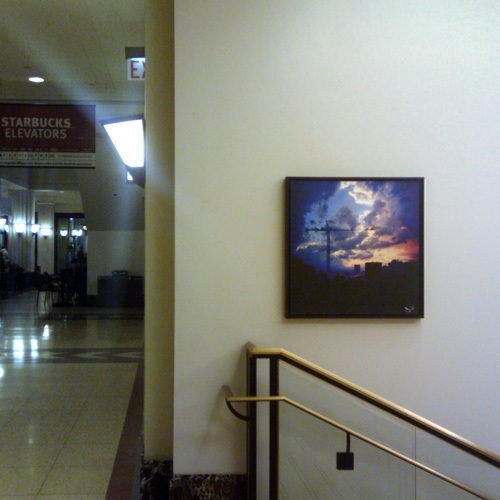 My print is on the 1st floor, towards the eastern side of the building, in a centrally located stairway, just below the Starbucks. If you have a chance, stop by and check it out in person and vote. View my Art Loop Open profile. Use your smartphone to scan the Microsoft Tag found on the plaque of each artwork, which will take you to the mobile voting site. The tag reader can be downloaded free at gettag.mobi. Use your regular phone and send ALO and the number of your favorite piece as a text to 75309 to vote for it (for example, ALO323 to vote for piece 323). Vote for as many of the 200 works of art as you like. At the end of Round 1, the top ten will be tallied. Vote for your favorite piece among the top ten finalists. Top THREE winners announced and all prizes awarded.